Every year, the Junior of League of Hampton Roads mentors the New Member class as they learn about the League, develop new skills, and create new friendships. Our 2017-2018 New Member Class has definitely made us very proud! Read on to learn more about their enormous contribution to the League this year! Every month, our new members meet with New Member chairs Kim Gibbs and Harper Bathel to discuss learn more about what it means to be a Junior League member and identify how they can use their individual strengths to benefit the League. In addition, the new members get the opportunity to learn more about one another through ice breakers and to talk with current League members about how to get the most out of their time as an active member. The cohort also takes time to plan their New Member project. 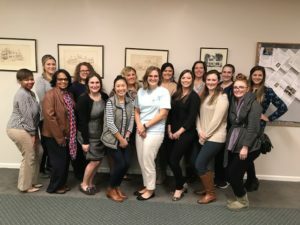 On May 9th, the 2017-2018 New Member Class hosted local daycare providers and SMART Beginnings at JLHR headquarters for an evening of hands-on storytelling education and exercises. This included incorporating the use of songs, rhythms, visuals, and physical items for students to touch and learn during story time. The daycare providers were also given a demonstration on animated story telling using a felt board. After the demonstration, the attendees stayed to work on creating more pieces for their personal felt boards that they would be taking with them. With the New Member project, they were able to provide 30 daycares with kits for success, reaching an estimated 300 infants and children in the community! When you combine that number with the number of infants and children impacted from the bookmarks that were distributed during the Touch-A-Truck event, the New Member project reached over 600 infants and children in total! The New Members goal was to spread awareness for early childhood literacy and to support the local community in being able to provide impactful early literacy skills to infants and children. They certainly met and exceeded their initial goal! On behalf of our 2017-2018 New Member class, we thank everyone who has supported and helped us in any form!